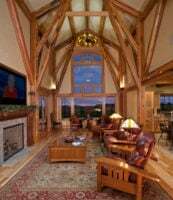 DW Timber Frame Design is a small, experienced, independent & affordable office specializing in the design of timber frame, post & beam, SIP (structural panel) homes and barns. Located in the foothills of Tennessee Smokey Mountains, but I work with clients throughout the USA. I service the residential and light commercial markets, providing architectural drawings, 3D renderings, timber frame and panel construction drawings to owner/builders, homeowners, timber/panel companies and construction professionals. If you have decided to cut the frame yourself, I’m available for questions/support as you are cutting & raising. If you would like to have it cut by a professional frame and/or SIP company, I will submit your plans to multiple companies for individual quotes.